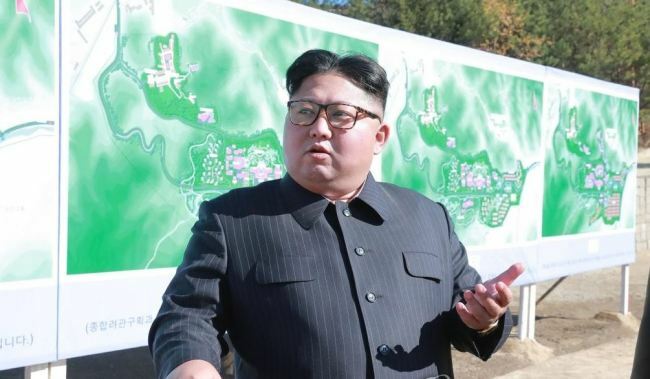 North Korean leader Kim Jong-un made far more public appearances in relation to the country's economic and diplomatic affairs this year than ones related to the military, an analysis of North Korean news reports showed Sunday. According Yonhap News Agency's analysis of North Korean news reports about Kim, the leader made 123 public outings such as on-site inspections and summit talks during the year dating from Jan. 1 to Friday. Of the total, 52 were in relation to diplomacy while another 43 concerned economic affairs. The two categories together accounted for 77.2 percent of Kim's total public appearances, a sharp change from 2017, when he was focused on military affairs. In 2017, North Korea's diplomatic ties with foreign countries, including its close allies like China and Russia, were seriously fractured as Pyongyang engaged in an unprecedented bout of provocative missile launches. That year, Kim reportedly did not attend a single diplomatic event. The tide turned this year, with Kim publicly giving up the country's long-held dual policy of pursuing both the nuclear and economic development in a plenary meeting of the ruling Workers' Party of Korea in April. He pledged to transfer all the national resources to the development of the economy only. Reflecting this shift, the number of Kim's economy-related public appearances increased 59.2 percent on-year to 43 this year. Meanwhile, Kim made only eight public appearances in relation to military affairs, an 80.5 percent dive from 2017's corresponding figure of 41. As Kim's landmark summits with his South Korean and United States counterparts this year window-dressed his external reputation, the North Korean leader also increased his public appearances, with the annual reported number of such events rising nearly 30 percent from 95 in 2017. This was the first growth in five years. Since 2013, when Kim was in his second year in power, the number of his public appearances had been on the wane every year. Kim's wife, Ri Sol-ju, accompanied the leader on 40 of his public outings this year, also a steep increase from seven in 2017.